OK, I know these two little plants are a bit esoteric but currently they give me joy as I have to present to a learned garden society in a few days about some of my favourite plants from my garden. Those of you who know Trelowarren well, will know that it has a fabulous garden history but is currently, as one polite gardener commented, ‘slightly over mature’! 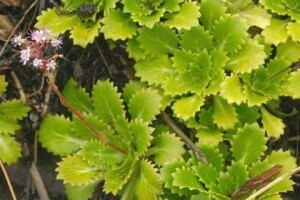 The first is ‘Sibthorpia europea’ or Cornish Moneywort. 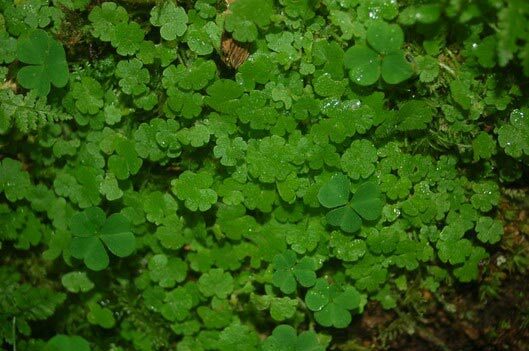 With small, creeping leaves, the Moneywort likes damp places by streams. The delicate white flowers, only one or two millimetres wide, are dwarfed by the umbrella-like green leaves on their long stems. It is a scarce member of the figwort family known as penny-pies in Cornwall, where it was first discovered in 1662 by John Ray. He was an early English botanist who first learnt about herbs from his mother, became an Oxford don and then undertook scientific research under the patronage of a wealthy former pupil, Francis Willoughby. 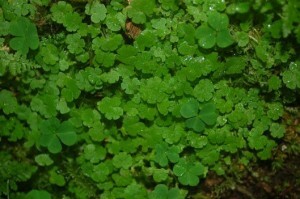 And the second is Saxifraga spathularis or St Patrick’cabbage (not London Pride, for which it is commonly mistaken). Part of the Lusitanian Flora, this perennial plant is very much a wildflower of the western parts of Ireland, hence its name. From May to August it raises erect stems up to 30cm high which bear panicles of star-shaped white, or sometimes pink, flowers (7-9mm across). The five petals are red spotted and the sepals turn down. The handsome thick, hairless and fleshy leaves are spoon-shaped, with zig-zag teeth which have translucent margins. These leaves are in a basal rosette which manages to find a foothold on rocks, coastal and mountainy ground. This is a native plant which belongs to the family Saxifragaceae. The familiar garden plant, London Pride, is thought to be a hybrid between Saxifraga spathularis and another member of the Saxifrage family found in the Pyrenees, Saxifraga umbrosa.